Yesterday had a surprise for me. It finally reached me, and it is absolutely wonderful. Want to see how it looks like? Here is a smaller version of the image for you, click on it to go to flickr page and view a larger size. This is a sleeve for my MBP that a dear friend made for me. 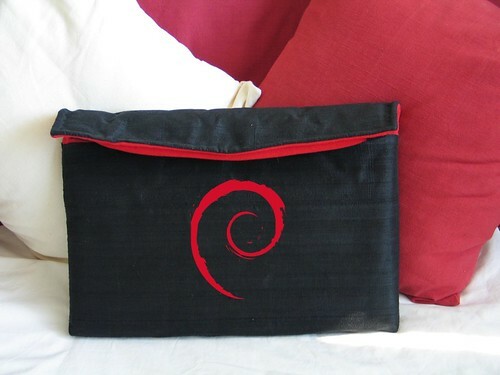 It is hand made and one-of-a-kind rather than being one of the run-of-the-mill laptop sleeves you can get online. The black part is a coarse silk cloth; used in order to make it more durable. 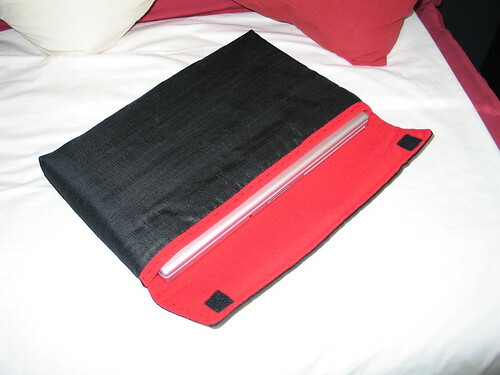 Inner lining is soft and is padded for safety of the laptop. It will be the obvious choice to carry the laptop to the café around the corner rather than the huge bag I use right now. And the best thing is that the older backpack I use for the laptop will take in the laptop along with the sleeve. Niceee :). I know it is a macbook pro I will have in the sleeve, but still I'm planning to put a nice logo on the sleeve's front side. Here is a mockup of what it might look if I get around to have that logo on it. Yes, you guessed it, its the oh, so dependable swirl. wow, it is really nice!!! you must be a very special person ;-)!!!! You back from wakations? How was it?